Point-of-Sale (POS) systems have revolutionized the restaurant industry, especially in the fast food sector. In most cases, registers are computers or tablets carried by the server. The registers connect to a server, often referred to as a “store controller” or a “central control unit”. Printers and monitors are also connected to the network. Remote servers, additionally, can be connected to store networks and monitor sales and other areas of restaurant data. Typical restaurant POS software is able to create and print guest checks, print orders to kitchens and bars for preparation, process credit cards and other payment cards and run reports. Some systems also implement wireless pagers and electronic signature capture devices. In regards to the fast food industry, displays are usually at the front counter, or configured for drive-through or walk-through cashiering and order taking. Front counter registers take and serve orders at the same terminal while, registers at drive-through windows allow orders to be taken at one or more of the windows, to be cashiered and served at a separate window. Additionally the displays are used to view the orders for preparation and to update the orders. Once orders appear they may be deleted or recalled by the touch interface or by bump bars. Drive-through window systems are often enhanced by the use of either wireless headsets or intercoms. The use of restaurant POS systems has increased the efficiency of orders and decreased service times, creating a more pleasant guest experience. Another innovation in restaurant technology is the wireless POS. Several restaurants, with high volume transactions, use wireless handheld POS to collect orders which are then sent to a server. The server then sends the required information to the kitchen in real time. 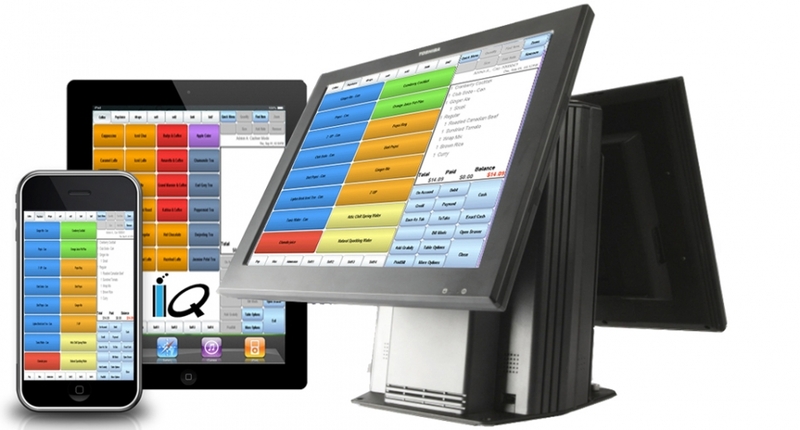 Tablet POS systems, that have been very popular for retail solutions, are also available for the restaurant industry. They are available for use in all types of restaurants, especially table service operations. Most tablet systems upload all the information to a cloud so managers and owners can view reports from anywhere with a password and Internet connection. Smartphones have increased the accessibility and efficiency of restaurant POS systems. Tablet and Smartphone POS applications include payments, loyalty rewards, online ordering, tableside ordering by staff and tabletop ordering by customers. POS systems can be programmed to fit any restaurant’s specific needs. The selection of a restaurant POS system is critical to the establishment’s daily operation and is a major investment that the restauranter needs to take care when selecting the system to best fit their needs.